Joel was born in the Chicago area, went to college in Maine, spent three years in Spain before going to EVST and has been in the Boston area since 1994. Professor of Environmental Health at UMass Lowell, Project Director of the Chemicals Policy and Science Initiative of the Lowell Center for Sustainable Production, and founder and Executive Director of the Green Chemistry and Commerce Council. Joel has many passions. He loves spending time with his two boys, Ari (19 years old) and Max (17 years old), and traveling, especially backpacking and seeing some of the world’s most amazing mountain ranges. "I love my work," says Joel. "For most of my life I wanted to be a doctor because I wanted to improve people’s lives. That changed over time, but my passion to make the world better has not," he says. "In EVST, I focused on the impacts of chemicals on health. I have spent significant time in communities affected by toxic contamination and have gotten tired of just fighting problems. I have realized we can make more progress focusing on sustainable solutions...my passion is to drive safer chemicals, materials and products into the marketplace in a way that protects our ecosystems and health." "My greatest accomplishment–beyond raising two well-rounded, thoughtful boys–is playing a critical role in moving innovative concepts in environmental health into the mainstream. This started with a significant effort to elevate the concept of the precautionary principle in science and policy; bringing the concept of comprehensive chemicals policy to the states; and more recently having chemicals alternatives assessment widely accepted as a science policy field and building a vibrant network of companies–from major retailers to major chemical companies working collaboratively to drive safer chemicals into the marketplace. It has been fulfilling to see a marked shift in the way we think about chemical hazards over the past five years from fighting over chemical toxicity (which we still do) to a more positive vision of evaluating, adopting, and scaling innovative, safer and more sustainable chemicals and materials. I’m happy to see concepts I helped seed, evolve into policy, science and practice. "Joel is a concept entrepreneur. He has used his position as a professor both to teach students about environmental health and to actively engage in improving it," says Dr. Ken Geiser, Professor Emeritus of the Lowell Center for Sustainable Production at the University of Massachusetts Lowell. "Recognizing that change is often blocked by conventional mind sets, Joel has learned to use novel ideas to open minds and change practices. He championed the precautionary principle here in the US, when American government officials were wary of even using the term. He advocated for green chemistry nationally when the established chemistry departments were still resistant. 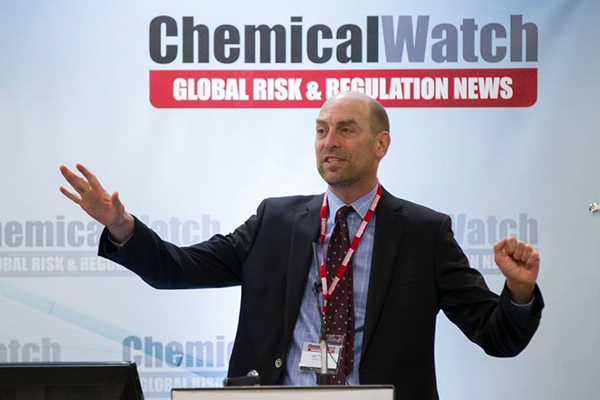 He promoted the concept and practice of alternative assessments for dangerous chemicals broadly among business, government and non-government leaders." Geiser explains that Joel has become a "national leader" by demonstrating the power of business collaborations in addressing the complex problems of sustainability in global supply chains. "EVST shaped who I am as a scientist, strategist and public health advocate," says Joel. "The connections I made through my work with (former EVST faculty) Mary O’Brien and Bruce Jennings have turned into some of my closest colleagues today. That wouldn’t have happened in most other places. The professors and advisors I had helped me to think holistically about the socioeconomic, scientific, and political aspects of environmental problems and how to link that focus on problems to advocating for holistic, preventive solutions. I was encouraged to think about my unique role as a scientist in solving some of our planet’s most pressing problems and to engage and always have in the back of my mind those affected by environmental degradation as I review science and propose solutions. I had been accepted into other graduate programs and I am lucky to have chosen EVST. I don’t think I’d be the thoughtful advocate, professor and professional I am today without my EVST experience."